Land Without End: The Barbarossa Campaign, 1941 is a two-player, low-to-intermediate complexity, strategic-level simulation of the German attempt to conquer the Soviet Union in 1941. The German player is on the offensive, attempting to win the game by rapidly seizing key cities. The Soviet player is primarily on the defensive, but the situation also requires he prosecute counterattacks throughout much of the game. Game play encompasses the period that began with the Germans launching their attack on 22 June 1941, and ends on 7 December of the same year. By that time it had become clear the invaders had shot their bolt without achieving their objectives. 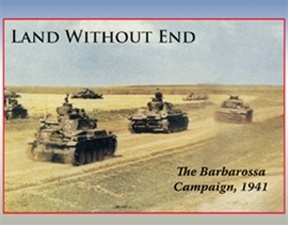 The game may end sooner than the historic termination time if the German player is able to advance so quickly he causes the overall political, socio-economic and military collapse of the Soviet Union. Each hexagon on the map represents approximately 20 miles (32 km) from side to opposite side. The units of maneuver for both sides are primarily divisions, along with Axis-satellite and Soviet corps (and one army) of various types. The effects of the general air superiority enjoyed by the Germans throughout the campaign are built into the movement and combat rules. Each game turn represents one week. 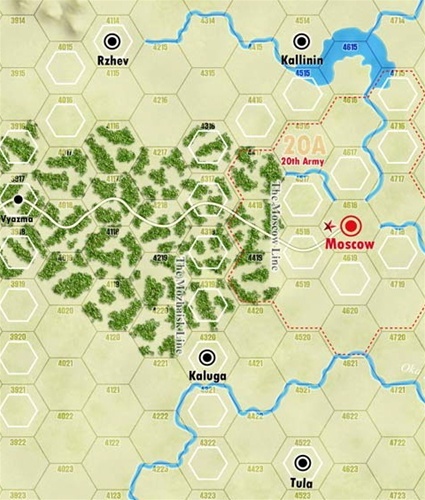 Players familiar with other strategic-level east front designs will note the unique aspects of LWE lie in its rules governing the treatment of supply, the capture of Moscow, and the Stalin line.